Superflex Takes on Brain Eater and the Team of Unthinkables. 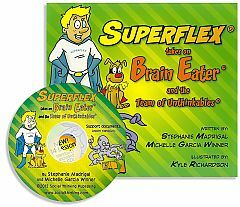 Superflex Takes on Brain Eater and the Team of Unthinkables by Stephanie Madrigal and Michelle Garcia Winner. Helps teach elementary school children how they can use strategies to conquer their own, not so flexible, team of unthinkables. Pp. 78. This entry was posted in Books for Children, Our Library and tagged Autism Spectrum Disorder, books, DVD, Michelle Garcia Winner. Bookmark the permalink.